United States President Franklin D. Roosevelt (January 30, 1882 - April 12, 1945) delivering the famous speech, "Yesterday, December 7th, 1941 — a date which will live in infamy — the United States of America was suddenly and deliberately attacked by naval and air forces of the Empire of Japan," before a joint session of Congress on December 8, 1941. Behind Roosevelt on the podium sits Vice President Henry A. Wallace (October 7, 1888 - November 18, 1965) and Speaker of the House Samuel T. Rayburn (January 6, 1882 - November 16, 1961). Obscured in shadow is Captain James Roosevelt (December 23, 1907 - August 13, 1991), the President's son, who accompanied his father to the Capitol Building. The speech began to take shape the day of the attack, and was written in a short time. While shocked by the casualty and damage reports, Roosevelt was the least surprised of his entourage and began to see how the crisis might unite the American people behind the war effort. Unlike most of Roosevelt's other speeches, which were written for him, Roosevelt himself dictated the speech to his secretary Grace Tully (August 9, 1900 - June 15, 1984). On the evening of December 7, before dinner with reporter Edward R. Murrow (April 25, 1908 - April 27, 1965) Roosevelt said to Tully, "Sit down, Grace, I'm going before Congress tomorrow, and I'd like to dictate my message. It will be short." He then consulted with Congressional leaders and military officers about the devastation in Hawaii while Murrow and his wife chatted with the First Lady over Eleanor Roosevelt's scrambled eggs. Colonel William J. "Wild Bill" Donovan (January 1, 1883 - February 8, 1959), who had Captain Roosevelt on his staff, talked with Murrow about American public opinion. Roosevelt, shaken by the damage reports, joined them. He was concerned about uniting Americans behind the war effort and feared that isolationist sentiments would not change, even after such a blow. Murrow assured Roosevelt public opinion would unite against Japan. Roosevelt made changes in pencil to the first draft Tully prepared. 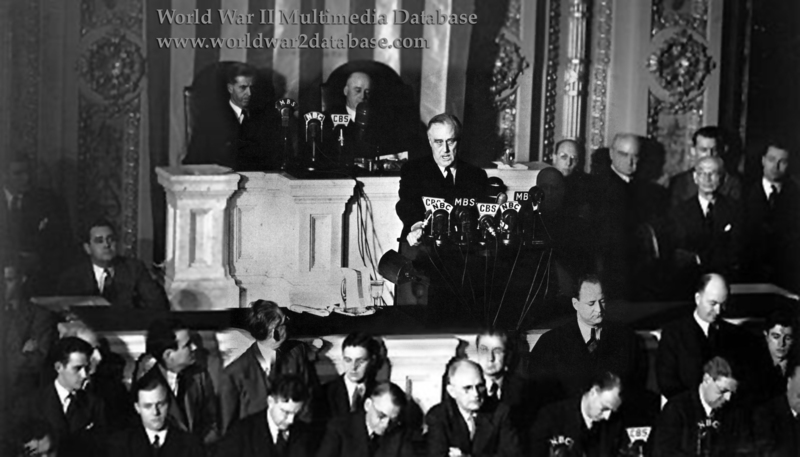 Roosevelt changed "world history" to read "infamy" creating on of the most important sentences in the speech.He eschewed the second draft, returning to the pencil-marked first draft, and made a few changes to the third draft. Despite requests from his staff, Roosevelt kept the speech short and did not focus on events leading up to the attack, but on Japan's failure to announce the declaration of war. The speech was a resounding success, generating positive telegrams and a slew of enlistments the next day. The reading copy of the speech was lost to history until it was found in the Senate archives in 1984; apparently Roosevelt left it on the podium and it was filed by a Senate clerk.